Germany Eavesdropped On Kerry, Clinton, Magazine Says : The Two-Way Der Spiegel reports that the current and former U.S. secretary of state were the inadvertent targets of German surveillance. U.S. Secretary of State John Kerry shown before boarding a helicopter to Amman, Jordan, in 2013. 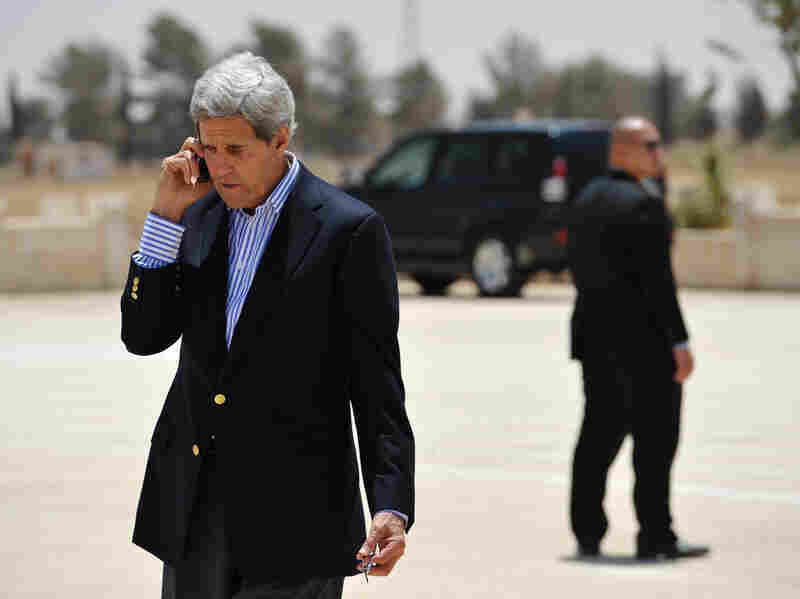 A report says that Germany inadvertently eavesdropped on at least one of Kerry's calls in the Middle East. Germany's foreign intelligence eavesdropped on the phone conversations of Secretary of State John Kerry and his predecessor, Hillary Clinton, according to the magazine Der Spiegel. The magazine said the German equivalent of the U.S. National Security Agency, known by its acronym BND, tapped a satellite conversation Kerry made in the Middle East in 2013. BND also recorded a conversation between then-Secretary of State Hillary Clinton and former U.N. Secretary-General Kofi Annan in 2012, according to Der Spiegel. However, the magazine says the information was collected accidentally and that Kerry, Clinton and Annan were not specifically targeted by German intelligence. It also says that the recordings were quickly destroyed. The magazine reports that the Clinton-Annan call took place on the same satellite frequency as a terror suspect who apparently was the actual target of German surveillance. The revelations put a new twist on Berlin's protests over revelations contained in leaks by former U.S. intelligence contractor Edward Snowden last year that the NSA had eavesdropped on German Chancellor Angela Merkel's calls. That information put a strain on U.S.-Germany relations and led Berlin in June to open a formal inquiry into the electronic surveillance.